Paper wasps (Polistes sp.) are long-legged, reddish brown to black insects with slender spindle-shaped abdomens. They may have differing degrees of yellowish or brown striping. They should not be confused with muddauber wasps, which are dark blue/black metallic wasps that build mud nests, and are not prone to sting. 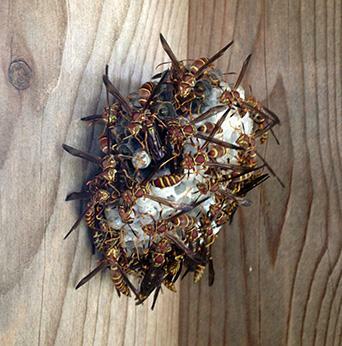 Paper wasps occur throughout most of the temperate climates of the world. The adult wasps typically prey on caterpillars and can be considered quite beneficial. However, they readily sting in defense of their nests. Female paper wasps emerge from sheltered areas in the spring and begin to construct grey, papery honeycomb-like cells under eaves, overhangs, window sills, open barns, etc. (Figure 2). Once the first few cells have been constructed, tiny, whitish, sausage-shaped eggs are laid, which will hatch in a few days. The female wasp will feed chewed-up caterpillars to her young wasp larvae until they seal their cells and become pupae. Once enough new female worker wasps have emerged, they take over the duties of food collection and nest construction and defense, while the queen remains with the nest producing more offspring (Figure 3). 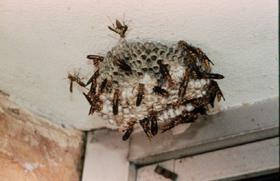 During the spring and summer the nest may enlarge to 6-8 inches in diameter with several dozen wasps. This is the time at which the greatest likelihood of stinging exists. Figure 2. Paper wasp honeycomb-like cells. Figure 3 - Closeup view of a paper wasp nest. 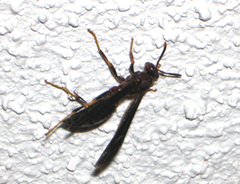 In early fall, the colony begins to produce males and special reproductive female wasps. These reproductive females, which constitute next year's queens, mate with males and soon leave the nest in search of protected spots in which they spend the winter. The remaining worker wasps eventually die and the nest becomes vacant. This old nest is not reused next year. Overwintering wasp queens seek shelter in hollow trees, under bark, in wood piles, attics, chimneys, barns, under siding, etc. On any warm day, the wasps may become active and fly about. If they have been resting in an attic, wall void or crawlspace, the wasps may be attracted to light coming through a gap in the baseboard or a wall fixture, or around an AC vent and emerge inside the building. Once inside a dwelling, the wasps may be found crawling on the floor, furniture or they may be attracted to light shining through windows. Since there are no nest or young to defend, the only real danger of being stung is from accidentally stepping on or pressing against one. Homeowners are sometimes unnecessarily concerned when they observe numerous wasps beating against the windows on a warm winter day. This behavior is not fully understood, but poses no threat. Taller houses and upper stories seem to be more attractive. Crane and tower operators are often dismayed by the large numbers of wasps which may congregate around these structures when the temperature is favorable. For more information, please see Paper Wasp Swarming Around Structures. Remember, paper wasps are actually beneficial insects because they prey on other insects that we consider pests of the shrubs and flowers around our homes. 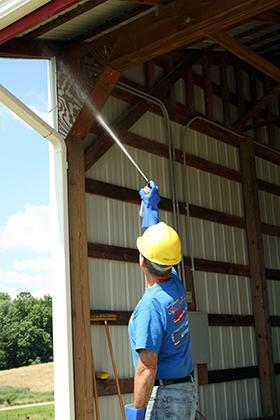 However, if the wasp nests are considered to be a hazard, they are most easily destroyed in the evening with an aerosol insecticide (Figure 4) that is labeled for "hornets or wasps." If the nest is just beginning with a single queen, a broom may be all that is needed to knock it down. In homes, attic vents should be properly screened to exclude overwintering queens. If they are already present, a total-release aerosol may be used on a warm day. Follow the product label instructions concerning how many cans are needed for the size area you are treating. Never exceed this number of units, and always be careful using these products near open flames. Wasps that somehow enter a dwelling may be swatted, stepped on, or vacuumed. For workers on towers or tall structures during the spring, there is little relief. Fortunately, this is a seasonal problem that will diminish as the nests are established. Work may need to be scheduled during cool temperatures. Workers should wear long sleeved shirts, long pants, gloves and hat. A beekeeper's veil may be worn to protect the face and neck, if this does not pose some sort of work hazard. For additional information, see the North Carolina Agricultural Chemicals Manual. Figure 4. Spraying a paper wasp nest. Watch for chemicals drifting down and back towards you.